Greater Manchester Police's top officer has allowed himself to be blasted with a 50,000-volt Taser gun in a bid to get them issued to frontline police. 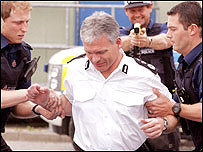 Chief Constable Michael Todd believes regular policemen and women should be given Tasers, which are currently issued only to firearms officers. The Home Office said it had no plans to make the guns widely available. Mr Todd said afterwards: "I couldn't move, it hurt like hell. I wouldn't want to do that again." A Taser blast incapacitates those it hits, but should not be fatal. 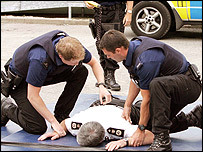 Mr Todd took the hit under controlled conditions at the force's Tactical Firearms Unit. His verdict was: "I've never experienced anything like it. You just seem to freeze. "If I was carrying a weapon and about to attack a member of the public when this happened, I couldn't have done anything at all, which is why it is important that we have them." Home Office minister Hazel Blears has said that the controversial gun was a dangerous weapon which should not yet be issued to frontline police.